layout-heavy books such as travel books or cook books. Even complex layout books can be implemented almost 1:1 as an ebook with the “fixed-layout ePUB”. Here each page looks the same as the PDF. 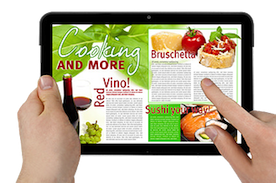 It can be designed individually so that double-sided layout, multi-column text, or firmly integrated design elements and fonts can be displayed in the ebook. Additionally, video and audio files can be added, images and 3-D graphics, zoomable maps and much more. An original-faithful implementation of complex layout templates is possible.